The Go! Go! 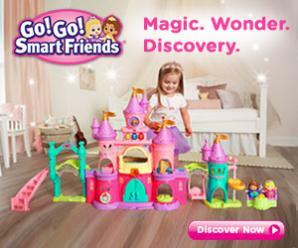 Smart Friends Enchanted Princess Palace by VTech is an epic palace that expands to more than four feet wide and has a variety of luxurious rooms, including a ballroom, music room, kitchen, parlor and observation tower. Play Sweepstakes on BlogHer runs from 10/3/16 through 10/31/16 and is only open to individuals who, at the time of entry deadline, are legal residents of the United States and are 18 years or older. Click "here" to read the official rules. Winners will be randomly selected from all eligible entries. Good luck!